It wasn’t long before the mailman delivered my subscription copy of FLASH #243, glimpsed earlier on the Daily Planet page. The issue sported another muddy Ernie Chua cover–I always felt a little bit sorry for the Trickster here, having to face his enemy the Flash bare-handed while all of his fellow Rogues had weapons drawn. 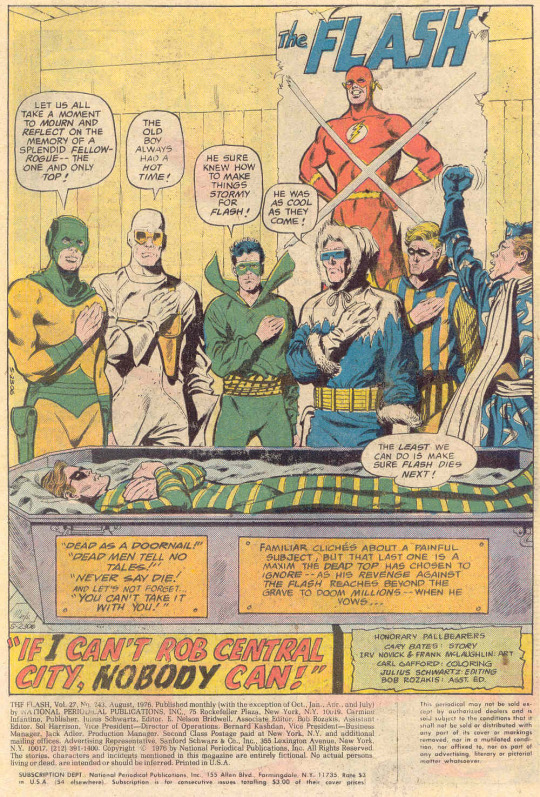 As set up in the previous issue–and given away on the cover–the story revolves around the actual no-fooling death of the Top, one of the Flash’s regular villains. An assortment of Rogues has been gathered by the Mirror Master to mark Roscoe Dillon’s passing and to hear his last words left behind on a tape recording for the Mirror Master to find. 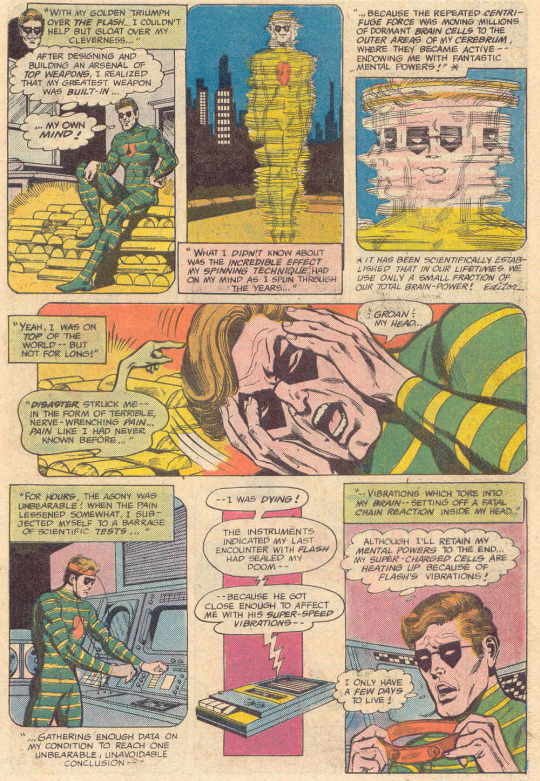 In his message, the Top reveals that he’d developed a new power of mind over matter thanks to his super-speed spinning–I’m not sure how that’s meant to work, but just go with it. 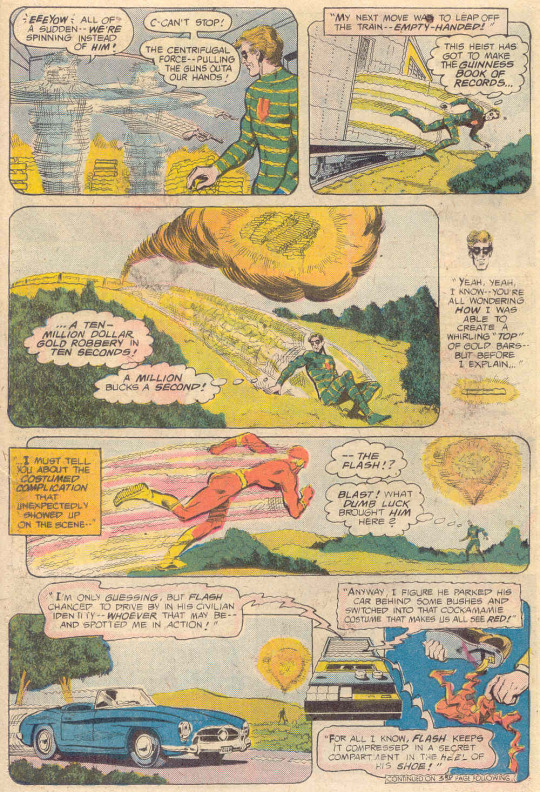 As is his wont, he uses this newfound ability to steal and plunder but is thwarted by his speedy foe, the Flash. One fun aspect of this story is that the Rogues, having no knowledge of the Scarlet Speedster apart from his super=heroic persona, fill in the gaps in his personal life with their own suppositions. And to make matters worse, the Top’s encounter with the Flash’s own super-speed vibrations have set off a fatal chain reaction within his own body that will shortly kill him. Coming to terms with his own impending demise, the spinning super-villain embarks on a daring and dramatic new crime wave, eluding the Flash right up until the end of his days using his new mind over matter powers. But what he’s really been doing is planting Top explosives in the locations of his thefts primed to detonate at a certain day and time and obliterate Central City. 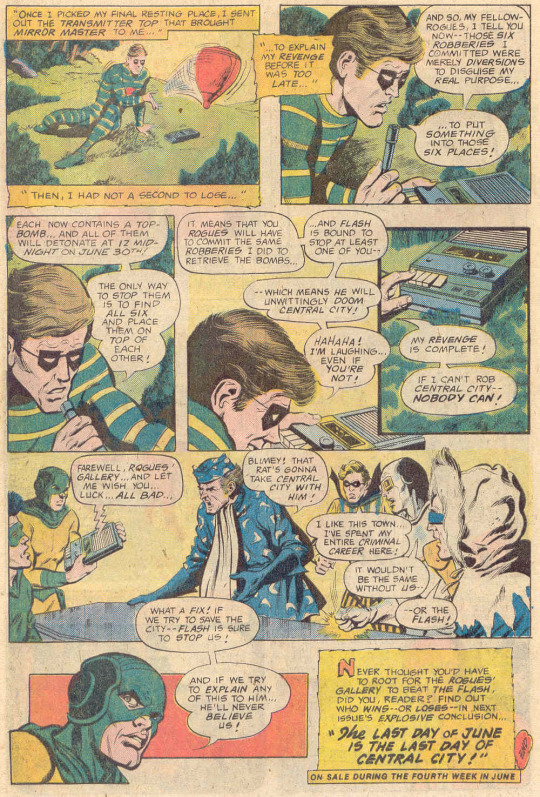 He challenges his fellow Rogues to duplicate his crimes and then deactivate the explosives by stacking the tops on one another, but he’s confident that the Flash will be able to stop at least one of them, and in so doing doom both them and the whole of Central City. So now the Rogues have a terrible choice to make–and that’s where the story is To Be Continued! This issue of FLASH also includes this typical page of ads for odd merchandise, the sort that was ubiquitous in comic books for decades. I only post it here now because I know that I sent away for that Baseball Card Locker–despite having scant interest in any sports I was on the same childhood bandwagon when it came to collecting Baseball Cards. Every boy my age did so, and I was as caught up in the chase as anybody. 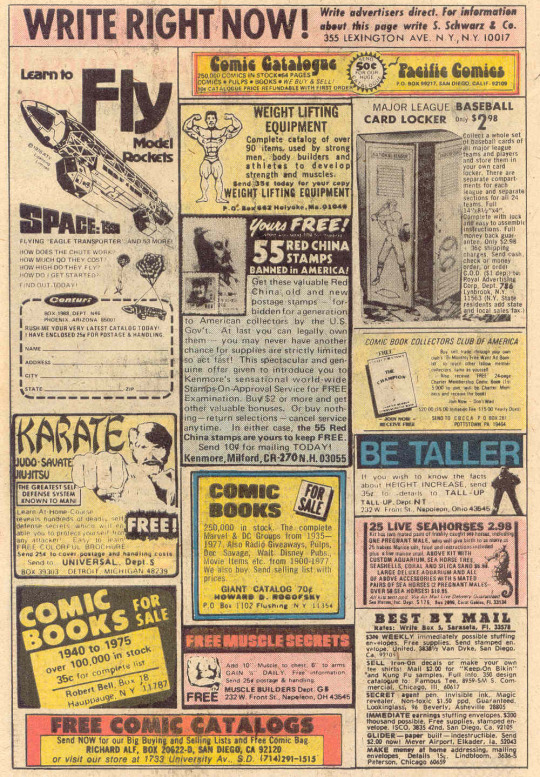 Eventually, though, my love for comics won out and the disposable income I would spend on Baseball Cards and Wacky Packages and other such things would instead be funneled into more comic book purchases. 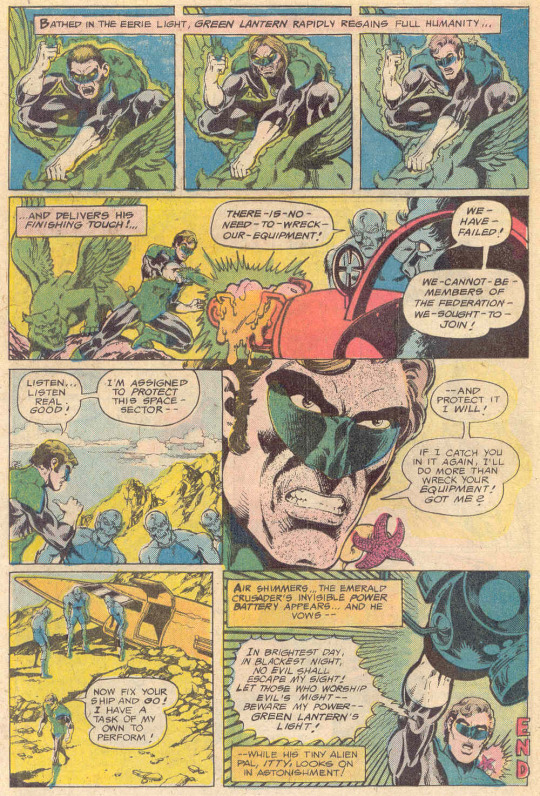 Really, after literally months of adventures, all Green Lantern does about these guys is wreck up their ship and tell them to cut it out, then wanders off to recharge his Power Ring. It’s really not much of an ending at all. 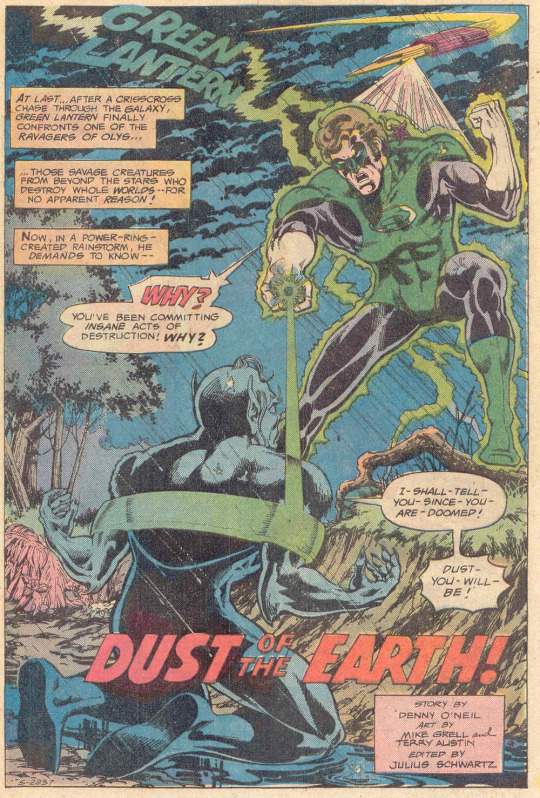 Of greater interest to me was the question of whether Green Lantern would continue to be a feature in FLASH how that his own magazine had been revived. I’d get my answer to that question in a few months’ time, and it turned out to be yes, but not for very long. But that’s a tale for the future.